Still catching up with those reviews, so here's my belated thoughts on the latest adventure of the crew of the Starship Enterprise. Following some needed R&R at the starbase Yorktown, Kirk (Chris Pine) and the crew seem ready for their five year mission to end. But when a discovered pod filled with survivors is picked up, the Enterprise is dispatched the area the pod's one survivor claims they were attacked, only to find (in the words of a certain admiral) "it's a trap!" 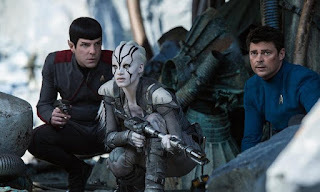 Soon the Enterprise is destroyed, Spock (Zachary Quinto) is injured and depending on McCoy (Karl Urban) to keep him alive, Kirk discovers the survivor is a traitor, Scotty (Simon Pegg) finds an unlikely ally in the form of Jaylah (Sofia Boutella) and the rest of the crew is captured by Krall (Idris Elba) an alien who needs human essence to stay alive (you know space vampires!). Eventually to save the universe it's going to take getting the team rescued, salvaging an ancient starship and the Beastie Boys to stop Krall. Yes the Beastie Boys save the universe. Who knew? Approaching Star Trek Beyond will depend on what side of the fence you sit on. A lot of people have enjoyed the new reboot series with its comedy, action and light approach the Final Frontier (except maybe Into Darkness). Classic Trekkies though have found little to appeal to them with the fast and loose treatment of the series and the characters. Looking at that I can see both sides in that Beyond is a fast-paced light entertainment with some welcome comedy (especially from Urban and Pegg), some rousing action scenes and forward momentum compared to the last film. Yet it still fails to equal the best of the original series-like The Wrath of Khan and The Voyage Home-due to overkill in some cases and a rather bland villain, despite the best efforts of Elba (who to be fair is much better than Cumberbatch's Khan). If the film does one thing right it is that it at least gives the cast enough breathing space without losing their charms or characters. Of the new ones I did like Boutella and her chemistry with Pegg provided the highlight of the film. Also delving in the past of the Federation is an intriguing concept that didn't get much play in previous attempts. And the tributes to late cast member Anton Yelchin and Leonard Nimoy were touching and moving. I guess as with Suicide Squad it's going to depend on what side of the aisle you sit on. As a fan of Shatner/Nimoy I'm giving Star Trek Beyond **1/2. As a guy who just likes a good time at the movies I'm giving it a ***/12 so it balances it out to a final three stars. Thank you. 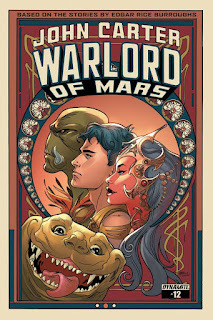 I liked the first, was not that fond of the second, this sounds like something worth watching in the theater again. I finally did watch The Legend of Tarzan last weekend. I guess I kept pushing it because I was scared I'd be disappointed, the concept and what came out before the movie sounded so promising. I did like it, in parts a lot, but there was one problem - Tarzan himself was too tame. I would have wanted the rather savage killer the original is to show at least in some scenes. This one didn't even kill anybody personally (unless it was some of the soldiers in the train scene), he used the animals to do that. He damn well should at least have twisted Rom's neck himself in their last confrontation instead of luring the crocodiles to do the deed (I guess gutting or cutting the throat with a knife would have been too much for the rating but... and no, he didn't even seem to carry that "his father's knife" himself, just picked up a couple sharp objects when he needed one. No rope either). I guess it was more disappointing because almost everything else was quite good.